A rhinoplasty can be performed using incisions inside the nostrils (closed rhinoplasty), or by making a small opening through the columella (open rhinoplasty). Dr. Roger J. Oldham in Bethesda, MD, is a renowned board-certified plastic surgeon who prefers the benefits of a closed technique. Knowing the difference between a closed vs. open rhinoplasty can help you determine which procedure is better suited for your needs. As a member of the prestigious Aesthetic Society of Plastic Surgery, Dr. Oldham has a reputation in the community for delivering exceptional results for our patients. Because of his extensive expertise and experience, he is also widely recognized as one of the foremost plastic surgeons in the area. During an open rhinoplasty, also known as an external rhinoplasty, the surgeon makes incisions within the nose and across the columella, the thin area below the nose and between the nostrils. The surgeon can then lift the tip of the nose for complete visibility of the underlying structure. Once it is lifted, the doctor can make both minor adjustments and extensive cartilage reshaping to help patients achieve their desired results. 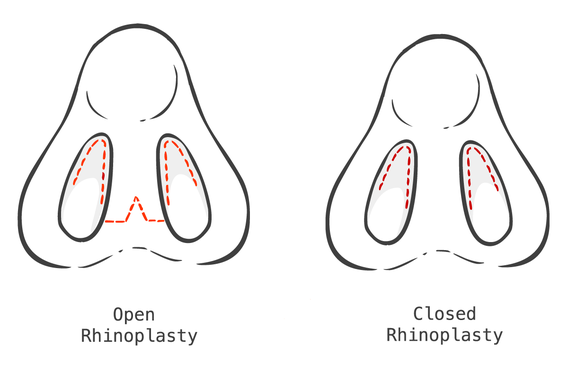 Closed rhinoplasty is the most frequently performed nose surgery. No visible external incisions are required during the traditional closed method. During a closed rhinoplasty, also known as an endonasal rhinoplasty, Dr. Oldham will make small, narrow incisions within the nasal canal for an overall less invasive procedure. Once these incisions are made, he can access underlying tissue to create a more attractive appearance and also correct breathing issues. Dr. Oldham is exceptionally skilled at performing closed rhinoplasty. This approach results in no visible scarring for the most natural-looking results. Some surgeons argue that due to limited visibility and reduced access, this technique restricts them from performing extensive reshaping. However, with the proper training, skilled surgeons such as Dr. Oldham can achieve comparable results with both techniques. In addition to producing no visible scarring, closed rhinoplasty typically results in less post-operative swelling. Because less tissue is disturbed, swelling should not only be reduced but also resolve more quickly than with an open technique. During your initial consultation, Dr. Oldham will perform a detailed evaluation and discuss the candidacy requirements at length. Because each patient is unique, Dr. Oldham will develop a treatment plan customized to address your cosmetic and functional concerns. It is important to note that Dr. Oldham will always place your best interests first. He will be completely upfront when it comes to evaluating which surgical technique is right for you. If you are interested in learning more about the benefits of an closed rhinoplasty, we are available to help answer any questions. You can call us at 301-530-6100 or contact us online to schedule your consultation with Dr. Oldham.